The Student Information control is designed to show information about a student. If it is viewed by a caregiver, it is automatically restricted to their children. What is view-able is affected by a variety of securities and configurations. This box is used to select a student. The advanced searching, press the magnifying class icon. For teachers, the students generally appear in surname order as this is the most common convention for creating the “Studkey”. For caregivers, they will be presented with a series of buttons labelled with their child’s name. 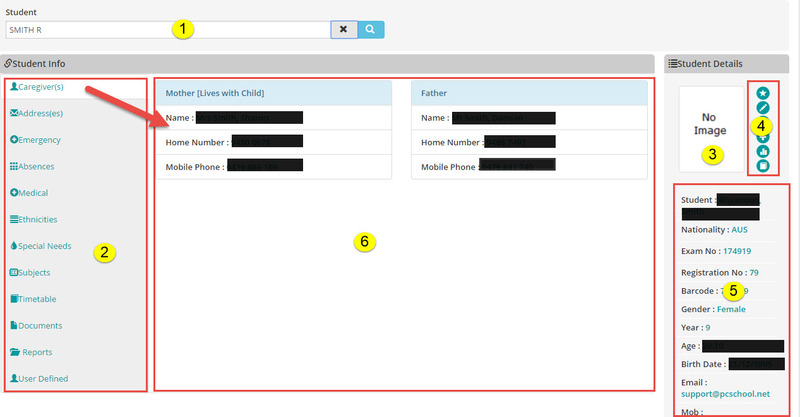 The search name can be configured to show other information such as their bar-code or registration number to help identify additional information about the student. This section shows the available tab for the user. Each tab is controlled by an individual security item. For more detail about this, click here. If the student image is available, it will preview here. These icons allow quick access to information about the student, as well as the ability to email them and enter medical notes. These buttons are governed by individual securities. For more detail about this, click here. This block of information presents key information about the student. Some values are configurable however due to screen real-estate limitations, not all information can be displayed here. This preview screen displays the information selected form the left side tab. This aspect of the control is governed by a configuration, as well as security. For more information regarding Document Management security, click here. As this is a “Student Information” control, only the Student Shared, Year Shared, Common Shared and Subject Shared folder will be available for viewing by parents, although staff may see other student based folders they have security for. Provided the Document Management has been enable for the user type logged in, and they have the necessary security, they should see the shared documents pertaining to the selected student. The folders you can see are based on the user having the associated security. The “Student Based Reports” show the reports that have been made available to Spider and are filtered by the type of user logged in. For information about publishing reports in Spider, click here.